I was in a bar the other night and overheard three very hefty women talking. Their accent appeared to be Scottish, so I approached and asked, "Hello, ladies are you three lassies from Scotland ?" One of them angrily screeched, "It's Wales, you bloody idiot, Wales!" So I apologized and replied, "I am so sorry. Are you three whales from Scotland ?" And that's the last thing I remember. I was in a bar the other night and overheard three very hefty women talking. 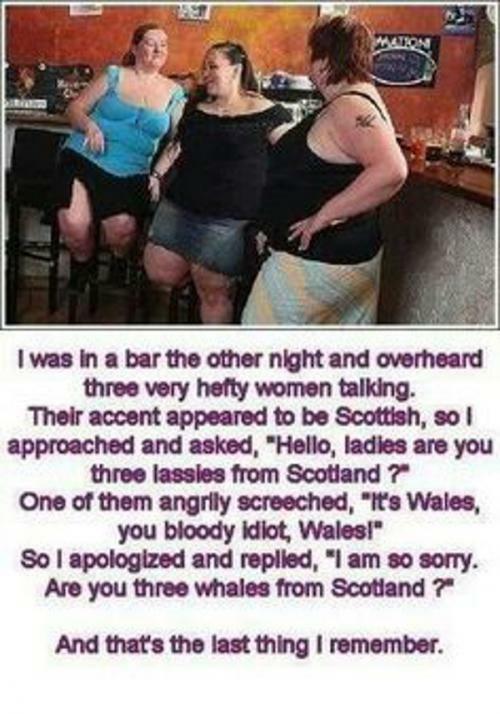 Their accent appeared to be Scottish, so I approached and asked, "Hello, ladies are you three lassies from Scotland ?" One of them angrily screeched, "It's Wales, you bloody idiot, Wales!"